Clear skies. Low 49F. Winds SW at 10 to 15 mph..
Clear skies. Low 49F. Winds SW at 10 to 15 mph. I was photographing murals in San Francisco when I came up with the idea of doing an article on body art. The variety of wall art in these neighborhoods got me thinking about all the people I’ve seen decorated with interesting and elaborate body art. Being curious but knowing little about the culture of tattoos, I began to do research and found that according to a 2012 Harris Poll, for the first time American women are more likely to get tattooed than men. Twenty-three percent of women have tattoos, compared with 19 percent of men. More surprising is that in 1897, the New York World newspaper estimated that 75 percent of American society women were tattooed, following a trend established in Europe. To get some personal insight, I began interviewing people who had interesting body art. Eventually I was able to interview eight people, four women and four men, who were willing to share their story and their body art with me. They ranged in age from 18 to 64 and included students, a retired police officer, a nurse-midwife, a vet tech, a pastry chef, a maintenance man and a quality-control inspector. Each had a personal reason for getting body art. The common theme seemed to be the spiritual quality it represented to them or some family symbolism that had personal meaning. 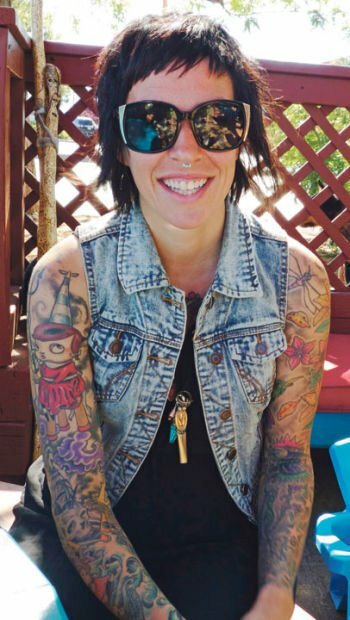 Lisa: A 31-year old grad student I met in Sedona, Ariz., Lisa began acquiring her body art at age 16. She said she just wanted to look different, so she covered her body in tattoos. She said she plans to get her doctorate and wants to be a college professor. Liliana and Rich: A married couple, they both have body art that represents symbols of their Native American ancestry. Liliana, a nurse and midwife of 57, got her first tattoo when she was in her 40s and working on the Navajo Reservation. At the time, she said, she was getting in touch with the spiritual side of her heritage. Her most impressive artwork is the mystical image of a thunderbird that stretches across her back to the shoulders. In certain indigenous cultures, the thunderbird is a symbol of power and strength. Her husband, Rich, a retired police officer, also has artwork that represents the spirituality of his heritage and the balance with nature. One arm shows a jaguar and thunderbird. 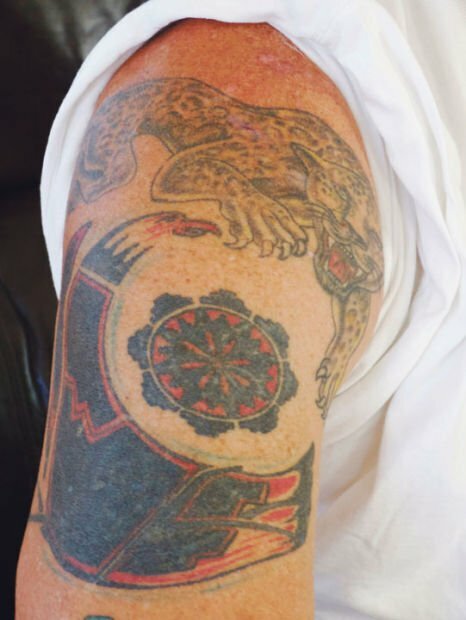 The other arm has an image of a cat chasing a rabbit, the same image that was on his father, who died in 2003. Frankie: A 25-year-old vet tech, she began her artwork when she was 18. Several years later, she has a number of colorful images on both arms, from flowers, seashell and jellyfish to the silhouettes of Peter Pan and Wendy. Her artwork continues to evolve as she adds new pieces to her collection. Bob: A 64-year retired quality-control inspector and motorcycle rider, he got his first tattoo when he was 52. His 18-year-old son wanted a tattoo, so they had it done together. The American eagle on his arm was put on later to honor his son, who was stationed in Iraq. Bob intends to add two dragons to his chest to represent his interest in the martial arts. Justin: An 18-year-old who plans to be a firefighter/paramedic, he just got his tattoo to honor his grandfather, who was in the 609th Special Ops and killed in Vietnam. His father was 2 years old when Justin’s grandfather was killed. Justin had been thinking about it for some time and finally decided it was the time to do it. Amy: A 37-year-old pastry chef, she got her first body artwork when she was 14. She researches thoroughly before she decides on a design. The elaborate designs on her back include crop circles, a double helix and the green man of the forest, which all represent symbols of her personal spiritual evolution. Wally: A 31-year old maintenance man, he began with a tattoo of his grandmother’s name on his chest after finding out seven years ago that she was terminally ill. The work on his arm is of his daughter Lanie at 2 months of age. She is now 6. I was fortunate that these people were willing to talk to me, and to allow me to take photos of their tattoos. None seemed to regret their tattoos, and a few plan to add more. No one mentioned experiencing negative reactions from others. With high-profile people like Angelina Jolie and San Francisco 49ers quarterback Colin Kaepernick displaying their tattoos, it seems that body art might be more acceptable, especially with the younger generation. Who knows, maybe someday we’ll see one of our City Council members or a county supervisor with the Statue of Liberty tattooed on an arm?